Just here to clear something up today. There seems to be some real and persistant confusion over the Spider-Man line of figures from ToyBiz. Namely, a lot of people think the line on shelves today is called Spider-Man Classics. Do a search on eBay or even on toy sites, and you'll find the new figures listed under "Spider-Man Classics." Why? Because no one's paying attention and that's what everyone else calls them. But really, Spider-Man Classics hasn't existed for years: SMC ended with Series 2 in September, 2001. "Spider-Man" and "Spider-Man Classics" are two different lines, unrelated except for the character at their heart. When ToyBiz debuted their Spider-Man Classics line in January, 2001, no one could have predicted how radically the toy industry would shift in just four short years. It was like dropping a stone in the water: the fallout is still on our shelves today. For years, McFarlane Toys had been directing the industry, making every other company raise the bar in terms of quality. 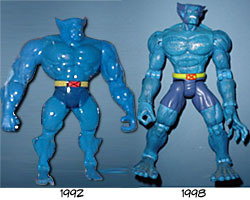 The best example may be ToyBiz: take a look at any two figures produced before and after 1994, and you can see just how Todd made things better for everyone. ToyBiz must have realized that they'd never be able to beat Todd at his own game, so they decided on a bold new course of action: keep the same high-quality sculpts they had been delivering, but up the articulation to insane amounts. Before Spider-Man Classics debuted, the average 5" figure had 10 joints: neck, waist, shoulders, elbows, hips and knees. A "superposeable" version might have 15. Today those numbers are a joke, but back then? Yeah, that's how it really was in the dark days of collecting. As everyone reading this knows, Spider-Man Classics changed all that. From out of nowhere came a figure with 30 points of articulation, standard, and it changed everything: that simple line defined one of the two major (and divergent) directions the industry would take. Unfortunately, Spider-Man Classics only lasted two series before it was cancelled: with the Spider-Man movie on the way, ToyBiz wanted to offer retailers a movie-specific line without a comic line competing for shelf space. So other than a few KB Toys exclusive repaints (and repackaged two-packs), those were the only eight Spider-Man Classics figures ever produced. All was not lost, though: ToyBiz took the innovations of the SMC line - free comics, detailed bases, a larger scale - and expanded them beyond the world of the wall-crawler, spinning the line off into Marvel Legends. Perhaps the scale change was the biggest gamble: for a decade, ToyBiz had been producing figures in a (more or less) 5" scale, when suddenly they began releasing figures that were too big to fit in with fans' existing collections. They'd tried larger figures before, but those had failed. Switching to the 6" scale has obviously paid off for ToyBiz, but it was a risk at the time. Once the Spider-Man movie line was finished, ToyBiz needed to find a way to keep milking their newest star. The answer was the adjectiveless Spider-Man line: no longer Classics, and no longer following the Classics sensibilities, the line wasted no time in turning into a completely average offering. In every four-figure series, three were Spider-Man and one was a villain. Now, admittedly, this is the same ratio we got in Spider-Man Classics, but that line only lasted two (and a half) series and it had already tapped out petty much every costume variation by the time it died. Marvel Legends does the same thing, but the difference is that they don't have to rely on just one character. Even the two series of Hulk had a better variety of figures, and he's had a lot less costume changes over the years than Spidey has. The ratio might be fine if the casepacks were better. The villain in a given series is often one per case, leaving the heavy-packed Spideys as pegwarmers, which keeps stores from ordering the new assortments and pisses off the fans. Add to that the fact that few of the figures are superposeable, most of them have intrusive action features and they don't come with bases or comics, and you've got a line that just doesn't live up to expectations. The line isn't without its strong points, however. Though the villains are hard to find, there's a nice variety of them available: it's not just endless Green Goblins. And though we like to pick on ToyBiz for reusing molds, most of the Spidey figures sport unique sculpts. Even Spider-Man Classics had one body that it used for most of the figures. It seems like there's a new superposeable Spider-Man every three series or so, when ToyBiz could just be repackaging the old one with new accessories. The Spider-Man Classics line was revolutionary, proving that sculpt and articulation are not opposite forces, but instead two components of a good action figure - you have to wonder what the line would have been like if it had continued. But while the Spider-Man line is a mostly mediocre replacement, it has given us a lot of good figures and it's certainly not the worst thing on the shelves today.